​For all Massachusetts Red Cross Volunteers who would like to request lodging, please fill out a "Lodging Request." You will receive confirmation by email. LODGING REGISTRATION WILL CLOSE ON AUGUST 15, 2017, AT 5:00 PM. This will be a paperless event. We will not be providing printed course materials. Please bring an electronic device (i.e. Laptop, iPad, Kindle, etc.) on which you can view the course materials. Course materials will be available on this site. If you prefer paper copies, please bring your own. You may contact your local American Red Cross office for assistance with printing of materials. Course descriptions and prerequisites are listed below. The purpose of this course is to prepare participants to perform the tasks of Red Cross Feeding workers in support of a local incident such as a single or multi-family fire, and a disaster relief operations. Participants will be able to identify canteening, mobile and fixed-site feeding tasks and identify procedures for handling food safely. 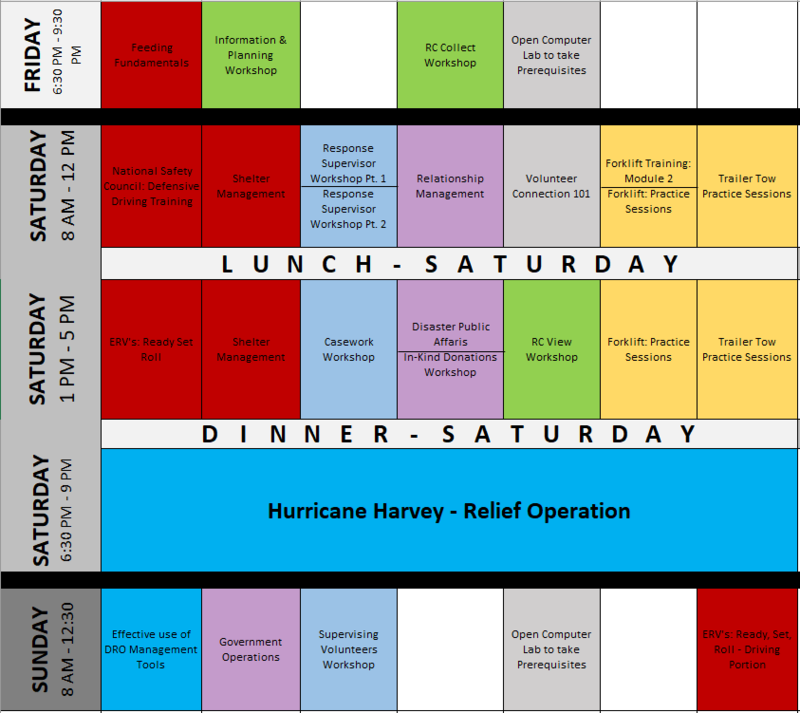 ​Interested in developing an Incident Action Plan for a Disaster Relief Operation? Come learn about the importance of information and planning as a tool and guide for effectively managing activities on an operation. Participants will use information for Saturday evening's table top exercise to develop and IAP, and will be able to see it play out when activities come together. RC Collect is an app system that can be used on any android or apple smartphone to assist in Damage Assessment on a Disaster Relief Operation. Anyone who is interested in Damage Assessment is welcome to join this workshop. Learn to directly input Damage Assessment into your phone and experience how it will benefit you in the field. 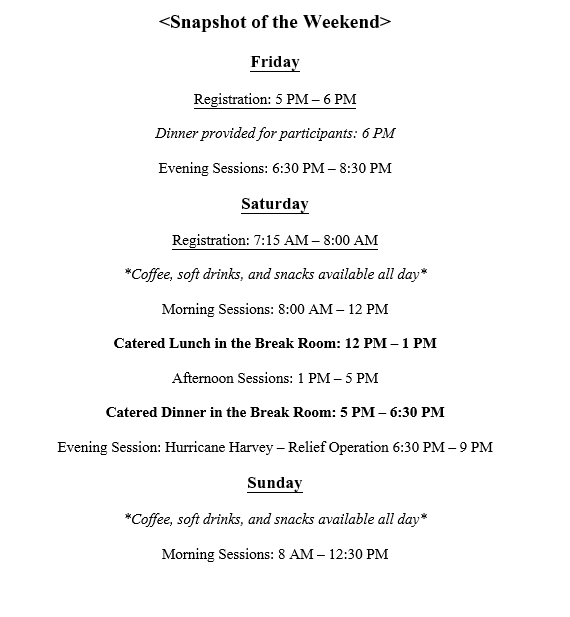 Open to all activities who might need this information for their role on a Disaster Relief Operation. Please bring your own smartphone to the class, the app will use minimal data. ​"As drivers, we are all active in our roadway community- the collection of person, motor vehicles, non-motorized vehicles, animals and all the elements on and around the roadways that make up our driving environment. Just as we are concerned about the communities we live in and the safety of neighborhood streets for our families, we are concerned about and responsible for the safety of our roadway community in which we travel." Prerequisites: You must bring to the course a copy of your driver's license and a DMV/RMV driving record. ​The purpose of this course is to introduce the roles, responsibilities and tasks of a shelter manager in a Red Cross shelter. The course content is based on the American Red Cross sheltering guidance. Successful completion of this course is one step in the process of becoming a shelter manger. This workshop introduces the roles, responsibilities, and tasks of a DAT Response Supervisor. Good for current DAT Supervisors or DAT Members interested in learning more about expectations of a DAT Supervisor on scene. Contains content specific to the MA Region, but others are welcome. In the second part of Response Supervisor, take a look at some unique case studies of past DAT runs. Ask questions, and revisit processes and triggers that led to certain decision making as a Supervisor. ​​Participants will engage in discussions and role plays to gain practice with the different skills and behaviors required for building, maintaining and rebuilding internal and external relationships. The course emphasizes the role that relationship management skills play in the successful planning, preparation and delivery of disaster services. New to the Red Cross? New to a promotion? Log on to a computer and explore Volunteer Connection, or catch up on some prerequisites! Our Volunteer Connection gurus are here to take you through the basics and answer any outstanding questions. Feel free to pop in and out of the lab for assistance! 8:00 AM- 10:00 AM, 2-hour practice sessions for the remainder of the day. ​This is a live trainer led course that uses the Module 1 (prerequisite) content to deliver hands-on training, including a forklift inspection and operator driving test. This course meets the requirements to work in Red Cross facilities that are managed by National Headquarters or regions on a day-to-day basis, or one that is opened to support a Disaster Relief Operation on a temporary basis. **Since Red Cross pays a fee for each participant who takes Module 1, it is important that only those workers qualified for and are in Logistics warehousing or Mass Care Build Distribution enroll in this course. If you are interested in completing the training you should talk with your regional Logistics lead to make sure this course is the right fit. You should have disaster experience in order to participate in this course. Prerequisites: Logistics: An Overview, Forklift Module 1, ALL MA RED CROSS VOLUNTEERS MUST BE APPROVED BY BRIAN SHEEHY: brian.sheehy@redcross.org. Anyone outside of the MA Region must get approval from their RDO. Learn and practice towing a shelter trailer. Intended for current MA Regional drivers willing to help with trailer resources needed on the scene. Good for DAT, Operations, and Logistics team members. ​This course will prepare its participants to operate a Red Cross Emergency Response Vehicle (ERV) and its equipment safely and effectively to meet feeding and other service needs of people affected by disaster. The purpose of this course is to introduce the roles, responsibilities and tasks of a shelter manager in a Red Cross shelter. The course content is based on the American Red Cross sheltering guidance. Successful completion of this course is one step in the process of becoming a shelter manger. ​Opportunities for caseworkers to practice their interviewing techniques, document casework, make appropriate referrals, and build a client recovery plan. Good for Disaster Action Teams and anyone interested in becoming involved with client recovery. Prerequisites: Recovery Services: An Overview, Casework and Recovery Planning Fundamentals, Direct Client Assistance Fundamentals, Direct Client Assistance CAS 2.0, Meet the Client: What is a Family? This course will introduce volunteers in how to respond to disasters large and small as a disaster public affairs representative. Volunteers will learn how to handle media affairs, social media, interviewing of clients and volunteers and digital photography and video (iPhone) to ensure that our work is recognized by the media, by partners, by fellow volunteers and by donors, potential and current. ​This workshop will introduce users to the basic functions of this powerful mapping and event management system. RC View is a helpful tool used on Disaster Relief Operations but can be utilized across all lines of service to record data, map routes, and show donors the use of personnel and materials on a job. In this class, participants will be able to describe the responsibilities of In-Kind Donations during a disaster response, and manage the process for receiving unsolicited donations and for soliciting donations as well as describe the value of donor relationships. You will learn how In-Kind Donation Leadership works with Fundraising staff. You will also be able to track received In-Kind Donations and complete accurate gift tracking IRS guidelines and generally accepted accounting principles. ​Newly certified and already certified may come practice their forklift skills in the warehouse! ​Learn and practice towing a shelter trailer. Intended for current MA Regional drivers willing to help with trailer resources needed on the scene. Good for DAT, Operations, and Logistics team members. Come hear about the relief efforts from Hurricane Harvey, how you can help, and news from the field! ​To staff, resource, plan, or supervise effectively on a Disaster Relief Operation. Practical tips on how to use the 204, Staff Request, 6409, or Work Performance Evaluation forms to get what you need! Good for those who deploy as well as for local DR's! 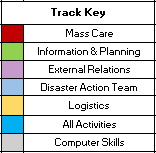 • Describe the liaison’s roles, responsibilities and assignment settings within the framework of the disaster cycle. • Manage and communicate critical information, offers and requests during the response phase. • Explain how to engage with partners to organize recovery efforts. ​• Describe the importance of coordinating with internal and external partners to meet needs and enhance service delivery. ​This instructor led workshop recognizes the impact of supervision on volunteer motivation and satisfaction within the Red Cross. In this time, you will be able to identify your strengths and how they relate to your role as a supervisor of volunteers, describe coaching skills and their relationship to the volunteer experience as well as identify 1-2 actions you commit to take to positively impact your volunteers' satisfaction. Good for current or developing supervisors.